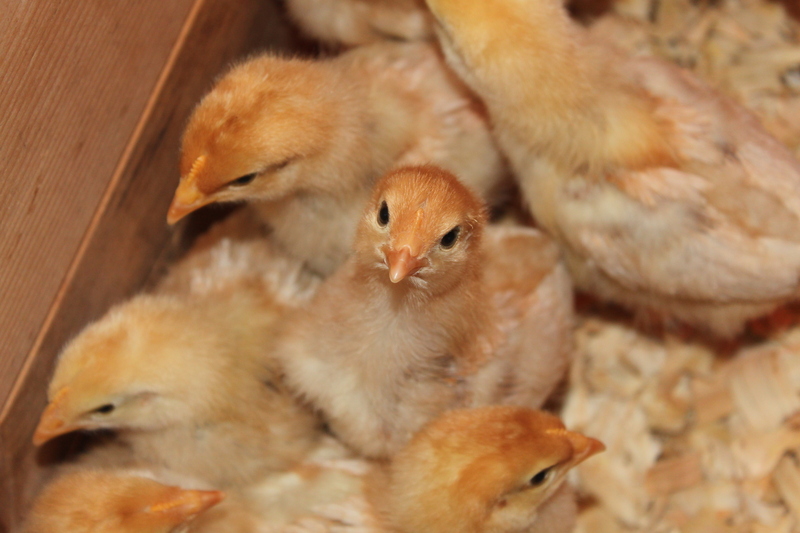 With springtime just around the corner – it won’t be long until you begin to hear the familiar “chirp-chirp-chirp” of little baby chicks for sale at your local farm or feed store. Raising your own chicks from day-old to adulthood can be a rewarding experience. Whatever your reason – raising a few chickens in your backyard can be a truly rewarding experience. The effort of raising a chicken is not a complicated experience – the key is all in the preparation! Whether you get your chicks through the mail, from a local breeder, or at your local feed or farm store – they will usually come to you as just a day or two old – and will need some TLC early on. 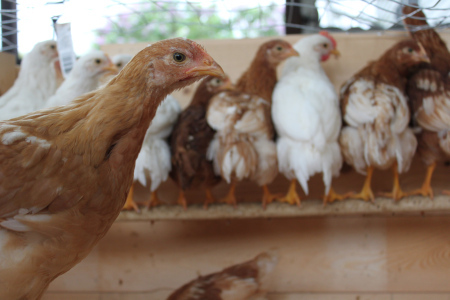 Although you can certainly purchase a commercial brooder – there is no need to spend a lot of resources on their temporary home. We created ours for free from spare pallets, shipping crate boards, and a little chicken wire. You can just as easily use a metal stock tank, or build a small pen from materials you have on hand. Although you may see many try the old “cardboard box” idea – it actually poses quite a few problems. For one – cardboard and heat lamps are a fire hazard – and second – little chicks have been known to chew right through them. Once the chicks reached about 4 weeks -we opened up the full length of the brooder. As you can see, our dog Jazzy loved to “watch” them. The key is to provide a safe and warm environment – along with plenty of water and food. You can purchase an inexpensive gravity waterer at most feed stores, and for our food – we use an organic chick feed for the first 8 weeks from a local farm store. Usually around week 4 we will start to blend it with some of the adult food to wean them off the starter. Your brooder should allow enough space for the baby chicks to roam about – but not so much that they can stray too far from the heat source. We raised 20 chicks in our homemade brooder that measured 4’ x 6’. For the first 3 weeks of their life – we placed a divider in the brooder to limit the access to only half of that to keep them closer to the heat source. To cover the floor – we used wood shavings. We have found that wood shavings are so much safer than straw early on – keeping the chicks clean and free of matting that can cause problems to their rear ends. If you do see one of your baby chicks becoming matted – by all means, clean them off with a little warm water. The baby chicks grow fast – here is one of ours at about 6 weeks. We use a heat lamp attached to the brooder to keep the temperature around 90 to 95 degrees during the baby chick’s first 5 to 7 days. With no feathers and just a little fuzz to protect them at birth, it’s important to provide them the warmth their little bodies need to survive. As they continue to grow – we reduce the temperature by about 5 degrees each week until they feather out and can provide their own body heat. It is amazing to watch how quickly they learn to use the water and food feeders. If you do see any struggling the first day to find it – the simple act of dunking their little beaks in the food or water will show them the way! 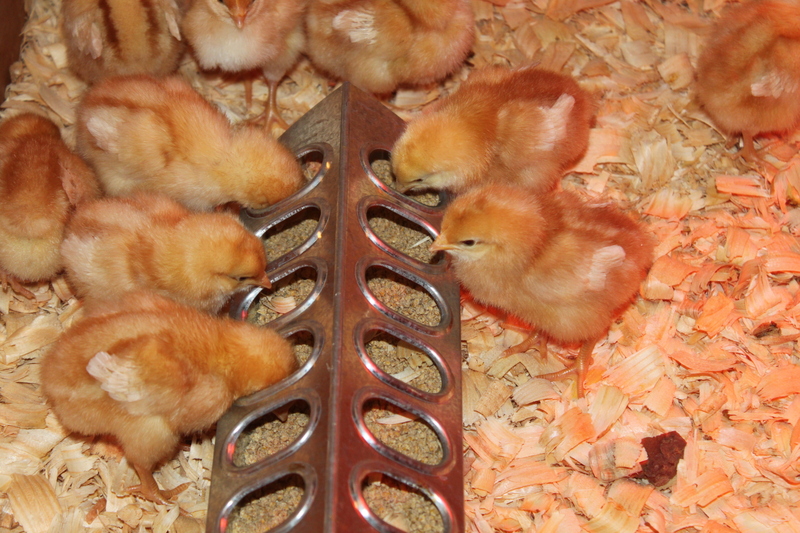 After the first week – we usually install a small perching dowel in the brooder to get them accustomed to it. It is amazing to see how quickly they begin to use it and learn the art of balancing on it. 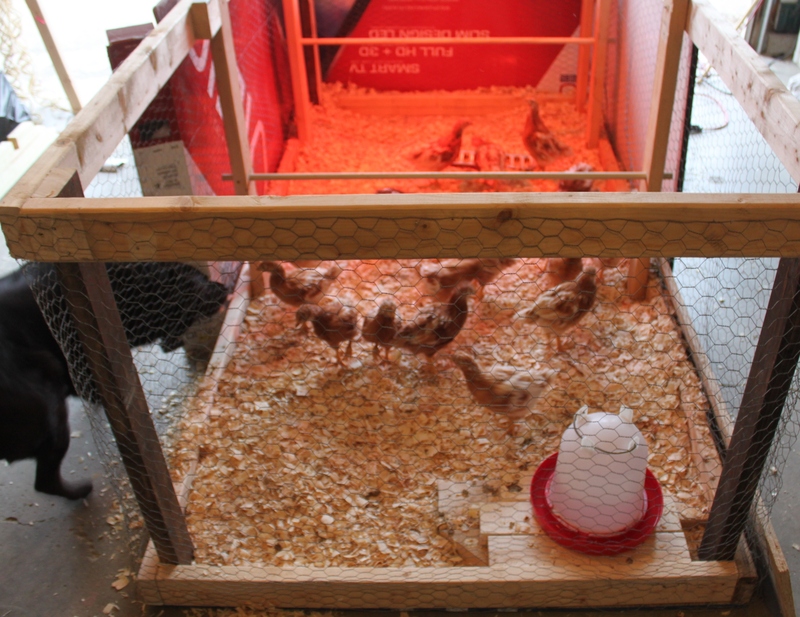 As the weeks progress – we will move it a little higher to get them accustomed to the perch in the big coop. Depending on the breed – it can take anywhere from 16 to 24 weeks for most new chicks to start laying eggs. The first few eggs are usually on the small side – but they get the hang of it pretty quick and before you know it, they start laying nice sized eggs on a regular basis. 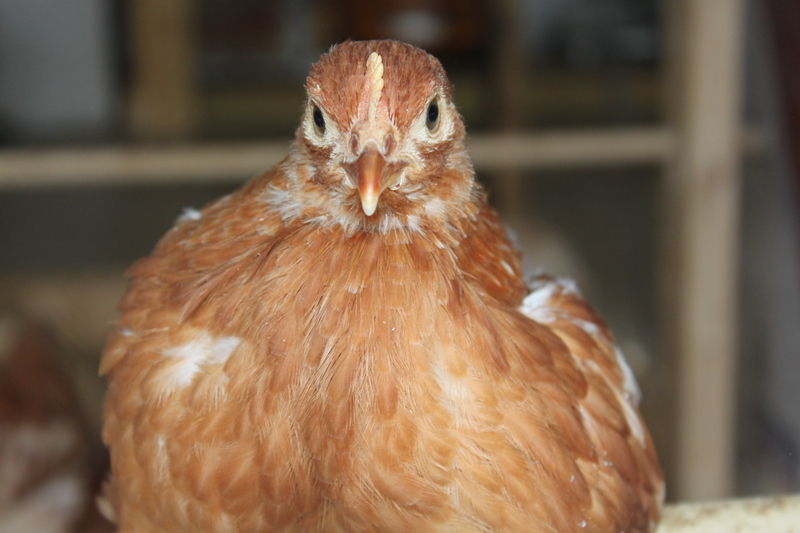 We raise mainly Golden Comets and Leghorns, and they will lay an egg about 6 of the 7 days each week – but the range can be all over depending on the type of breed you choose. Happy Gardening and Chick Raising – Jim and Mary!